Ultra Violet Light Destroys the DNA of Bacteria, Viruses, and Parasitic Protozoa. SteriPEN™ is the only portable water purifier that uses ultraviolet (UV) light to destroy waterborne microbes. Whether your source is a woodland brook or an overseas hotel tap, SteriPEN purifies clear water in seconds. Carry a SteriPEN to disinfect water wherever you travel, hike, camp or trek. It’s the fastest route to pure, safe drinking water anywhere. SteriPEN’s Ultraviolet (UV-C) light rays safely sterilize clear water by destroying viruses, bacteria and protozoa, including Giardia and Cryptosporidium. If clear water is not available, no worries—the Hydro Photon Pre-Filter clears particulates and debris from water. Purifies 16 fl. oz. of water (cold or warm) in less than a minute, or 32 fl. oz. in a minute and a half. SteriPEN™ turns itself off once ultraviolet treatment is complete; can be used up to 5,000 times. Water bottle not included. The Journey mates with the SteriPEN pre-filter and is sized between our Adventurer and Classic. SteriPEN’s Ultraviolet (UV-C) light rays safely sterilize clear water by destroying viruses, bacteria and protozoa, including Giardia and Cryptosporidium. If clear water is not available, no worries—the Hydro Photon Pre-Filter clears particulates and debris from water. Purifies 16 fl. oz. of water (cold or warm) in less than a minute, or 32 fl. oz. in a minute and a half. SteriPEN™ turns itself off once ultraviolet treatment is complete; can be used up to 10,000 times. Includes two non-rechargeable batteries. Adventurer provides the same great water treatment as the original SteriPEN™, but with a smaller size and even lower weight. SteriPEN™ Adventurer also features a soft-touch coating, offering a comfortable texture in your hand and scratch resistance in harsh environments. Now packaged with the popular Solar Charging case, the SteriPEN Adventurer lets you travel the world without lugging around a bunch of batteries. 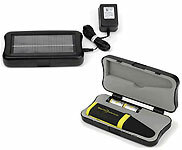 Solar Charging clamshell case pulls double duty, providing handy, secure storage for the purifier AND recharging its two CR123 lithium batteries. Adventurer purifier provides the same great water treatment as the original SteriPEN, but with a smaller size and even lower weight. Case interior is molded of soft foam for safe transport.